Durango Silver Company has been producing Silver Turquoise Bracelets for over 40 years, our specialty is high quality, natural Turquoise. If you are a collector or are interested in American handcrafted Silver Bracelets with authentic blue Turquoise, our company produces some of the finest coming out of the American Southwestern USA today. When looking at Turquoise Jewelry, you should know there is a major difference between quality handmade Turquoise Jewelry from the American Southwest and inferior production or import Turquoise costume Jewelry. The Bracelet above was made by a skilled craftsman and days of intense work were put into this piece, it is substantially priced piece of Turquoise Jewelry that has real value today and greater value in the future. 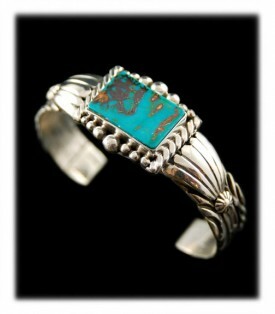 Above and to the left is Navajo handmade Silver Turquoise Bracelet created by Ben Yazzie. This is a Turquoise Cuff Bracelet that features a gorgeous Easter Blue Turquoise Gemstone from the old Easter Blue Mine located near Tonopah, Nevada USA. 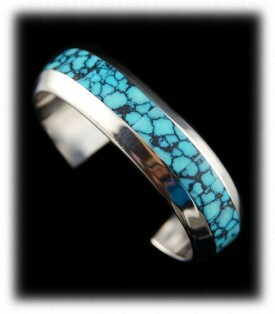 Ben did an exceptional job on hand stamp work to create this one-of-a-kind Native American Turquoise Bracelet. Above and to the right is a unique bold Blue Kingman Turquoise Bracelet in Sterling Silver created by John Hartman. The focus is on this marvelous Blue Turquoise gemstone with unusual golden matrix that is very attractive. 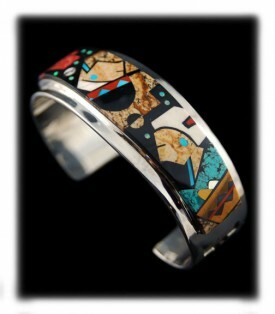 Above and to the left is a wonderful Navajo Inlay Bracelet created by Edison Yazzie (Navajo). This is called a pictorial Inlay Bracelet and it depicts a Navajo Man and a Navajo Squaw with a basket and corn, this is highly unusual inlay work and we love having Edison's pieces. Check this bracelet out on its presentation page and also type Edison Yazzie in the search box to see more of his inlay work. 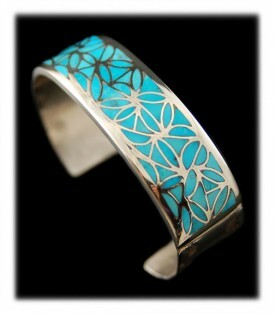 Above and to the right is a Silver Turquoise Bracelet created by Native American artist Johnny Coonis. This silver cuff bracelet is built to last it features high grade, Spiderweb Tibetan Turquoise and is made of heavy silver. 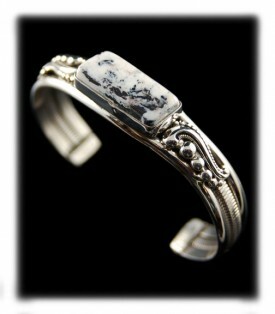 This Native American made Silver Bracelet was made to fit a gentleman's wrist. Above and to the left is a Victorian style Silver White Turquoise Bracelet. 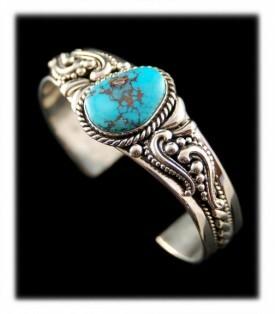 It has a White Buffalo Turquoise gemstone set in Sterling Silver in a Victorian style with repose scrolls and beadwork. This is a one of a kind piece created by John Hartman and it is has a beautiful flowing design that everyone is certain to appreciate. To the right is another Silver Turquoise Bracelet made in America by John Hartman of Durango, Colorado USA. It features a beautiful Blue Bisbee Turquoise stone accented by luscious Victorian silverwork John is becoming noted for. Johns high relief scroll and beadwork is something out of the ordinary which depicts old world designs from the past. His unusual new Jewelry style is becoming popular by Jewelry Connoisseur's quickly. Type in Victorian in the search box to see more of Johns new designs. 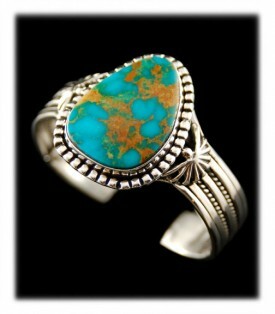 Surf our website and check all our categories for more one-of-a-kind Silver Turquoise Jewelry and bracelets. We invite you to check out the Silver Turquoise Bracelets we have available today, follow the arrow to the buttons on the left side of this page. Also, here are a couple of pages on blue Turquoise Jewelry, blue Turquoise Pendants, Blue Turquoise Bracelet, and Blue Turquoise Rings, we think you will find interesting and educational. We invite you to learn more about Silver and Turquoise Jewelry by following the links in our Learning Center. In addition, we would like to invite you to join our E-Mail Newsletter - about once every other month we send out a Newsletter to inform our members of what's happening at Durango Silver Company, new products, specials for our members only and more. We also have a monthly drawing from our member base to give away Free Turquoise Jewelry from our company. Please take a moment to become one of our friends by signing in below. We thank you for your time and hope you will think of Durango Silver Company the next time you are considering quality Silver Turquoise Bracelets made in America.